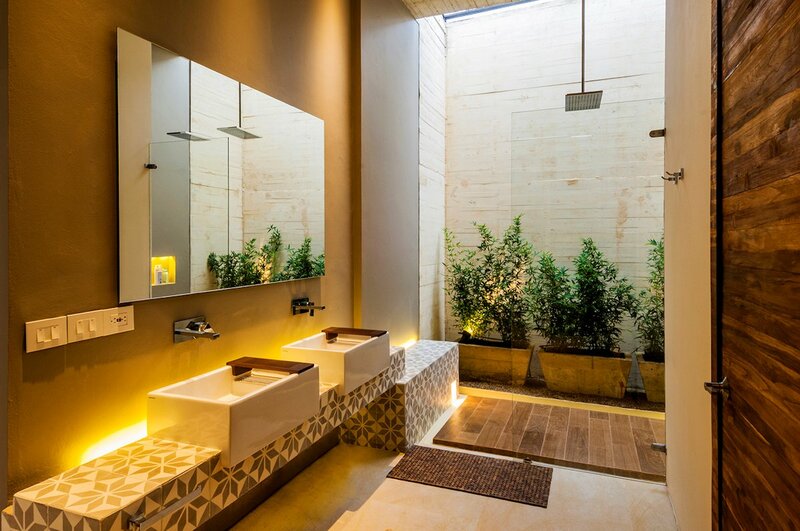 Casa 7A was completed by the Bogotá based studio Arquitectura en Estudio and Natalia Heredia. 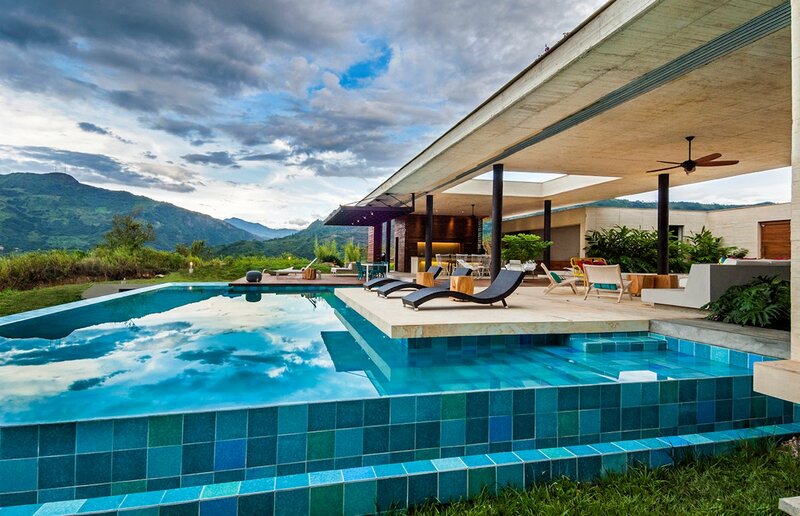 This 5,920 square foot, modern country house is oriented north-south allowing the swimming pool and terrace areas permanent exposure to the sun, while taking advantage of the fabulous views towards the mountains and stream. 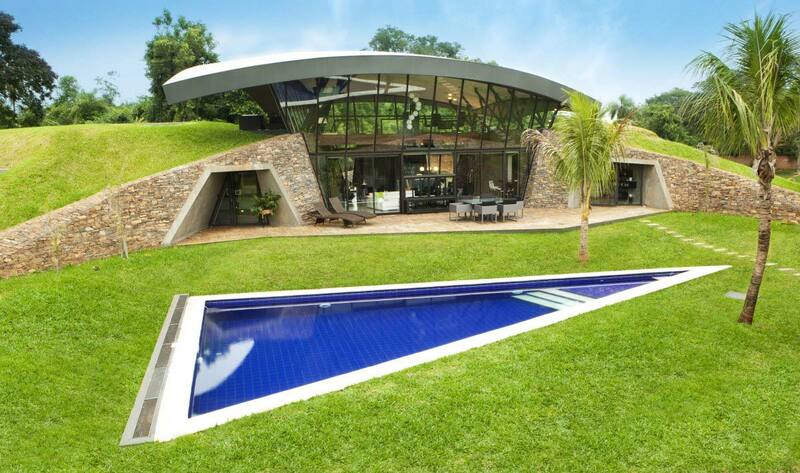 Casa 7A is located in the town of Villeta, Colombia. 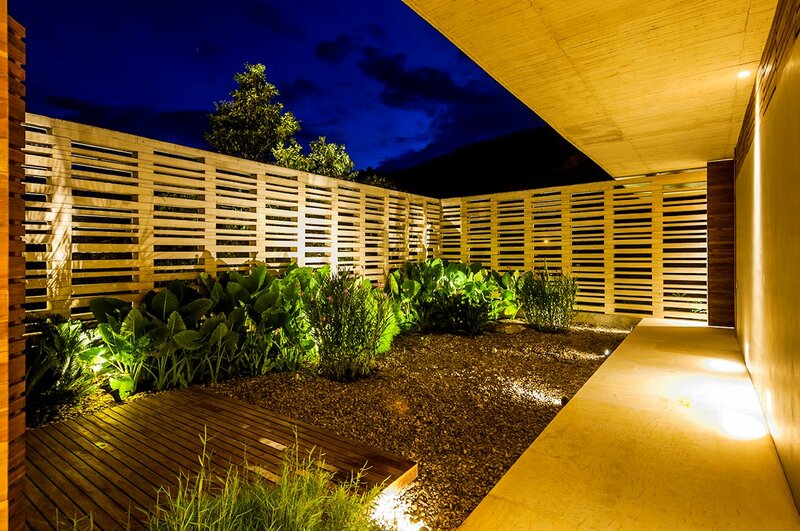 “The challenge was to design a country house in the surroundings of the town of Villeta (Colombia), 1.5 hours to the west of Bogotá; at 967 meters above sea level, with a predominantly hot and dry weather all year round. The site’s constraints were very clear; a very steep land that starts at the top of a hill going all the way down to the stream “El Cojo”. 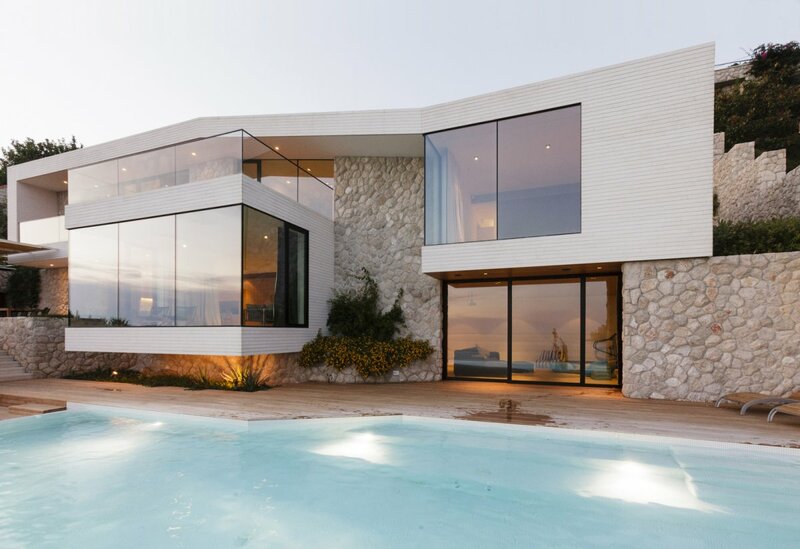 The brief asked for a built area of 550m2, including 3 rooms, studio, service and social areas, a terrace and a swimming pool, all this under one essential demand: the house must be able to be completely closed whenever it’s not in use. 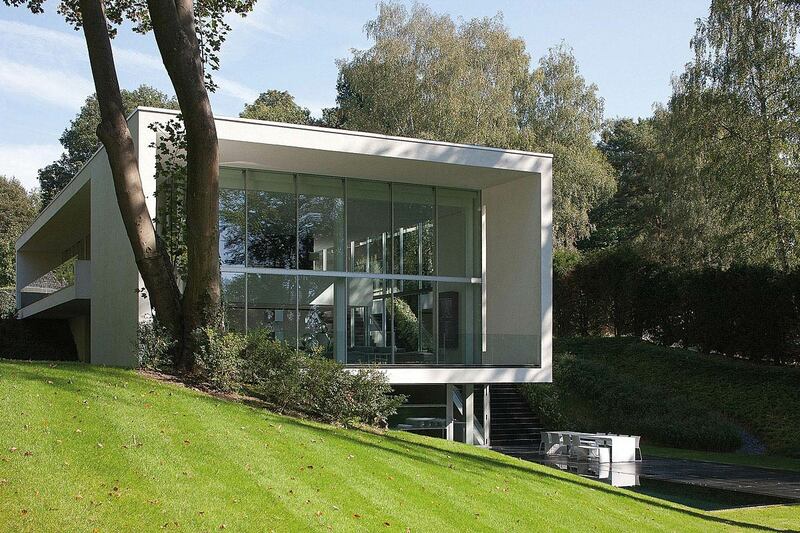 The place defines completely the conception of the project. We start from two basic elements in architecture:The roof, which protects from the elements, but at the same time serves as a tool to relate directly to the surroundings. The roof, clean and horizontal, frames the landscape and protects from sun and rain, while it dilutes the limits between the inside and the outside, between the natural and the man-made. The patio, the space that allows us to bring nature into architecture, helps us gain control over the natural elements which would otherwise be alien. 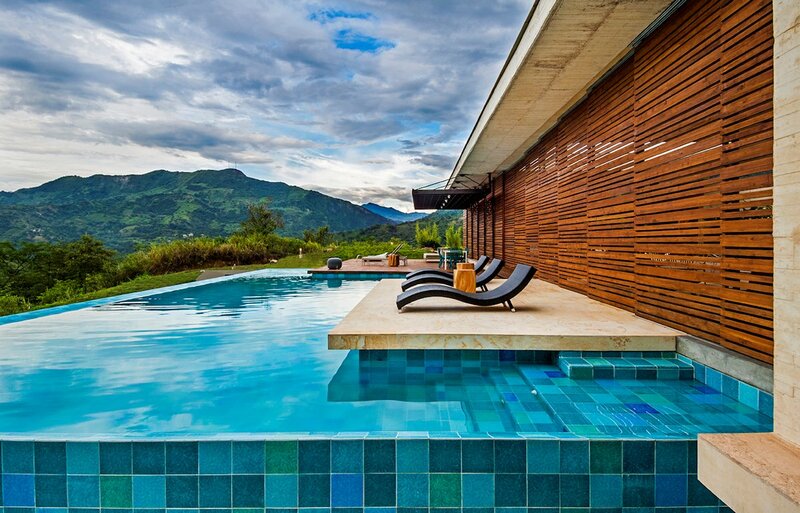 The patio generates an intimate scale generating close relations and sensations, in contrast to the long views provided by the mountains. 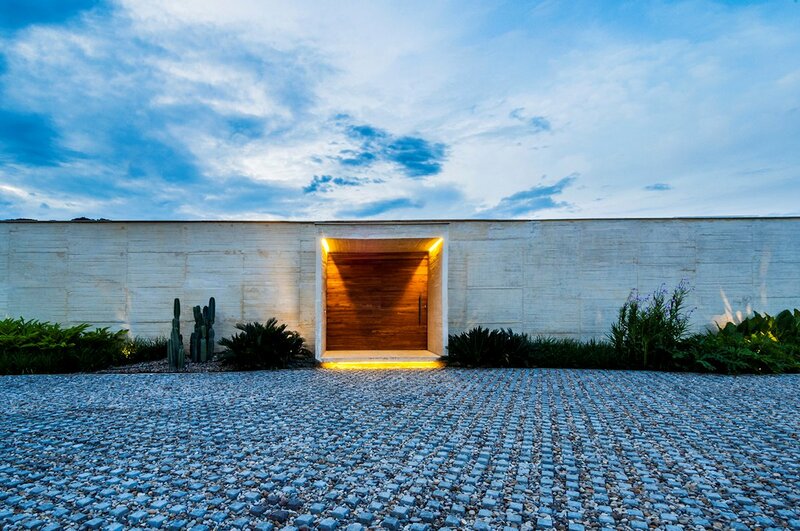 Spatially, the house is organized through a succession of voids and blocks that live under the roof, which is open towards the mountains on one side and towards a series of patios on the other. 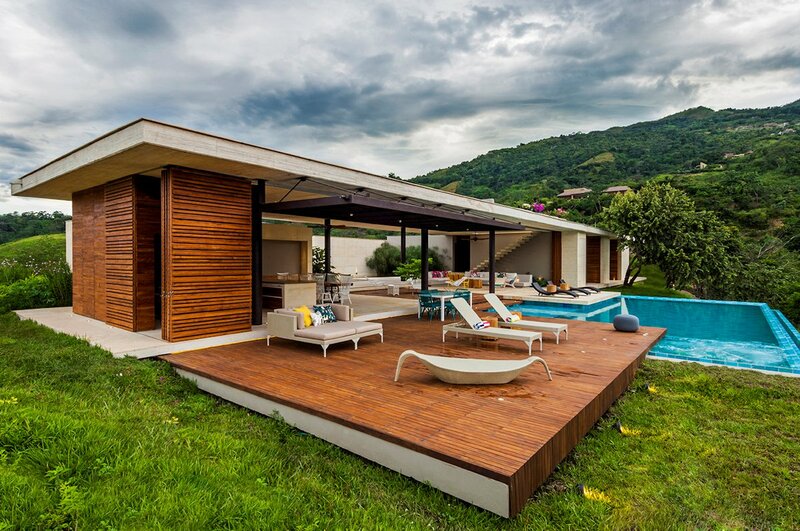 This double spatial relation (patio-roof-mountains) (near-far) generates diversity and richness within the different spaces of the house, providing the opportunity for different use dynamics at different times of day. 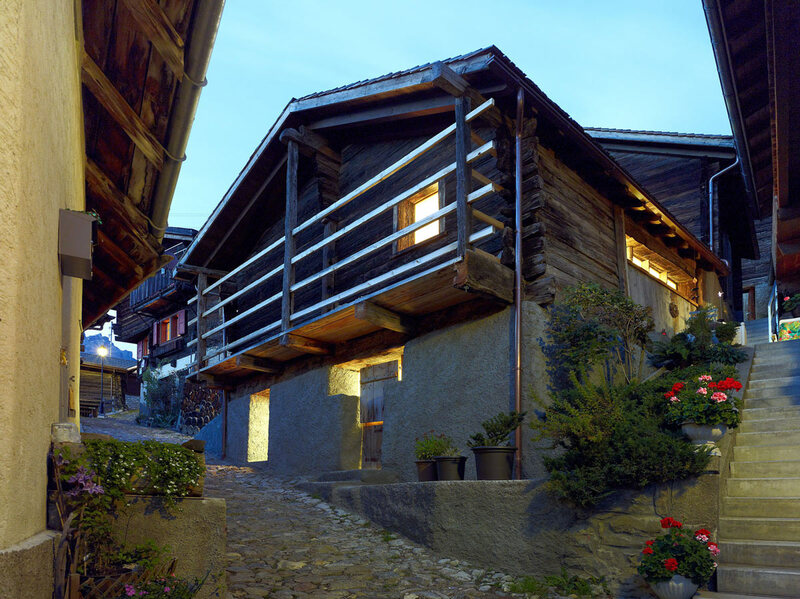 Towards the road, the house shows itself completely closed, providing privacy and generating expectation as to what happens inside. 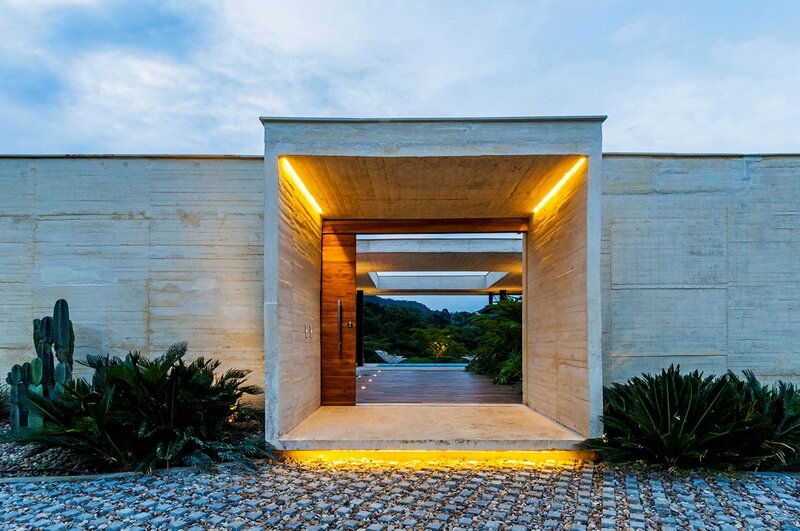 You enter through an intentionally low and narrow block, which enriches the expectation; crossing the threshold, the preception changes; the space opening up through a patio that frames the uninterrupted view of the mountains. 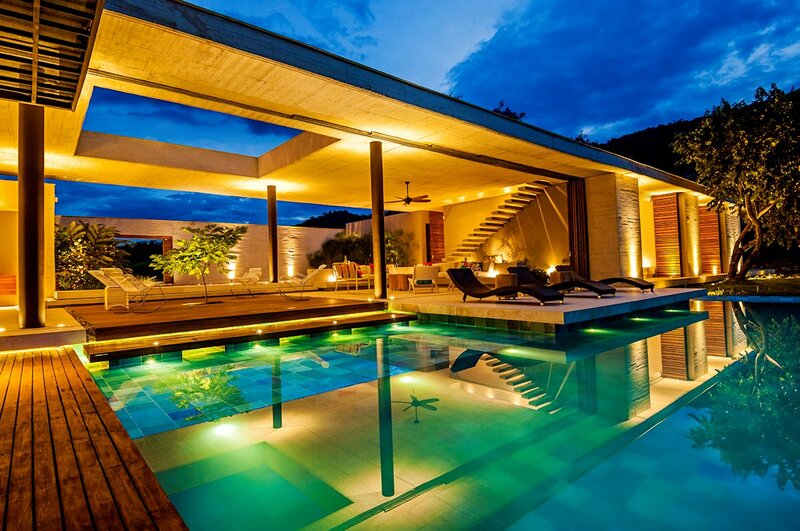 From the entrance, the platform that holds the social areas seems to float between the water feature at the entrance and the swimming pool; once again allowing the natural elements to dominate the space. 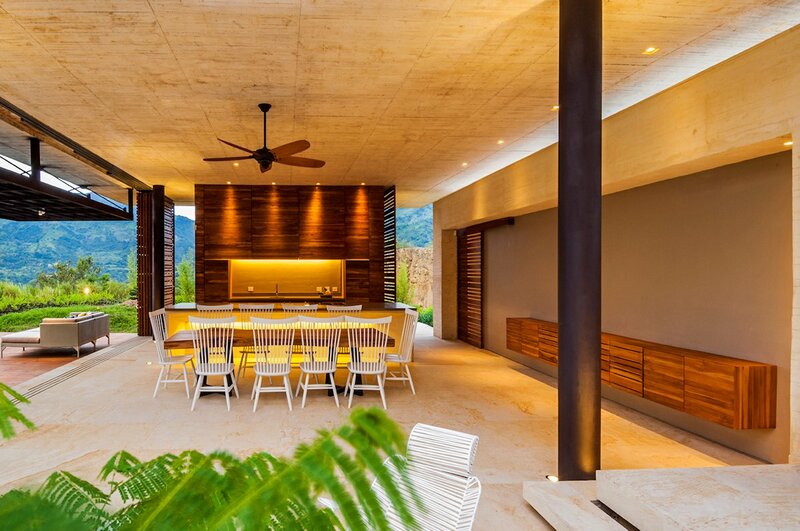 The social areas appear as a unique space, open towards the mountains on one side and to the entrance patio on the other. 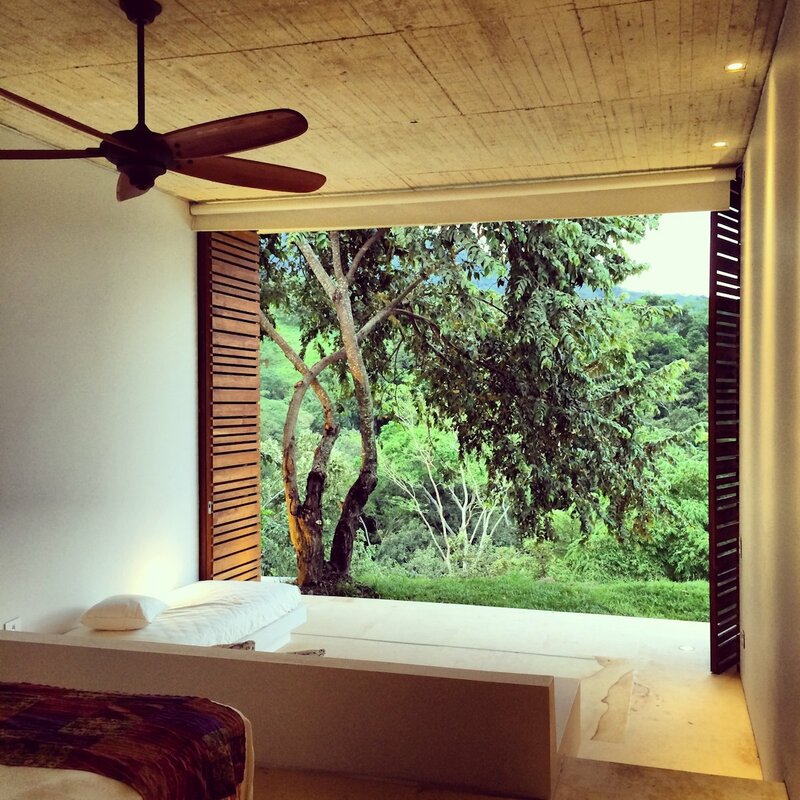 The character of this space is defined, simultaneously, by a second patio, framed by a void in the roof. 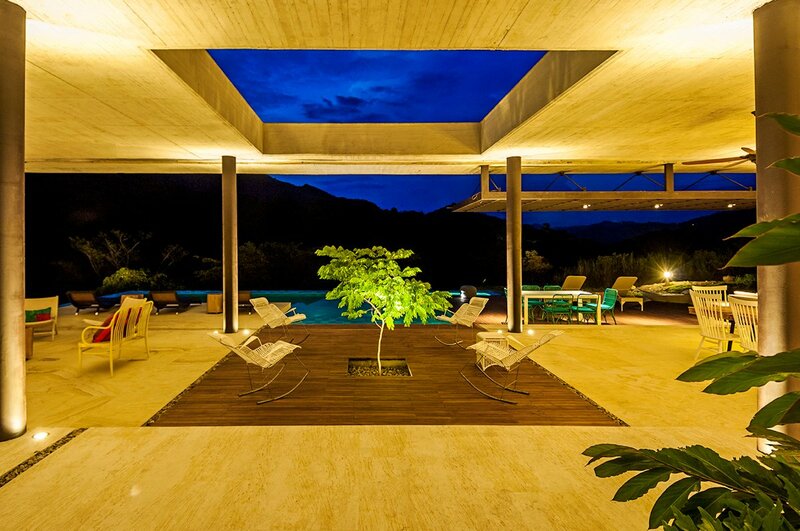 Centered in this patio lives an Acacia, whose foliage will protect from the sun, while it marks the meeting point of the two main axes of the house (entrance – swimming pool & kitchen – rooms). It is the heart of the house. 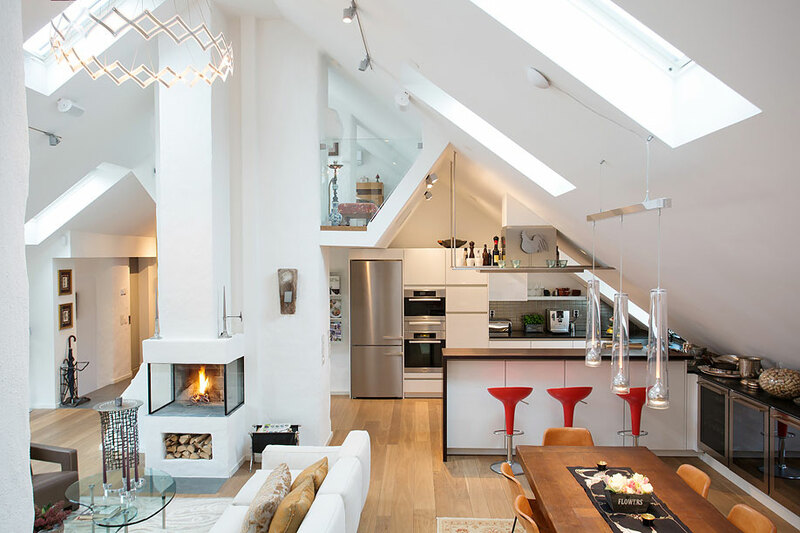 At the east, around the dining area, we find the kitchen and service areas that appear as a lower block, subtly inserted under the main roof. 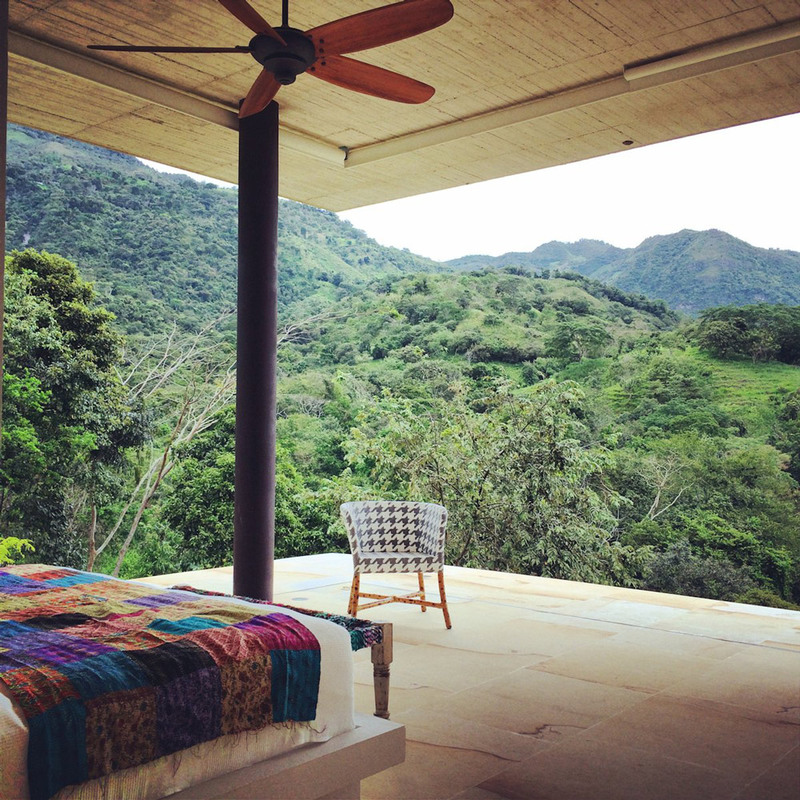 The opposite wing houses the private areas for the rooms, which face the mountains and are articulated by a third patio that, proposing a completely different character, is defined by a permeable wall made in prefabricated concrete blocks and an exuberant native garden. The facade brings an essential question to the nature of the project: how to generate completely open spaces that can be closed off when not in use. 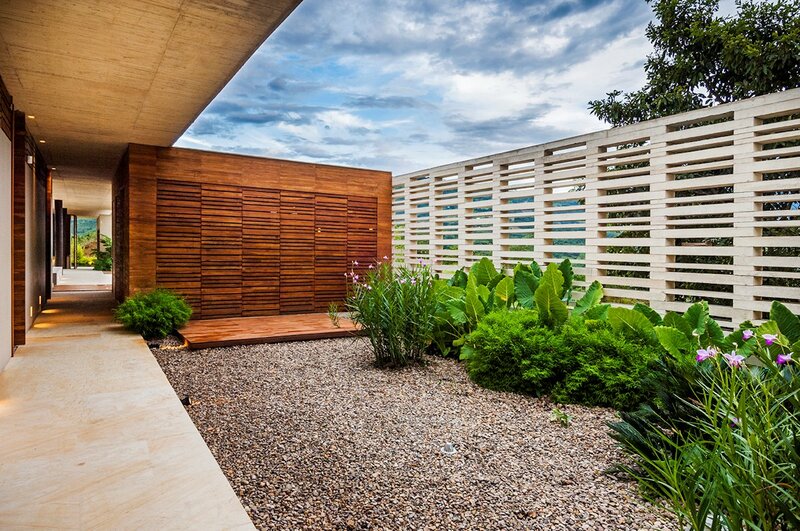 For all the areas of the house (private and social), timber screen panels were designed in order for them to slide or pivot and allow for closing off or opening up the space 100%. 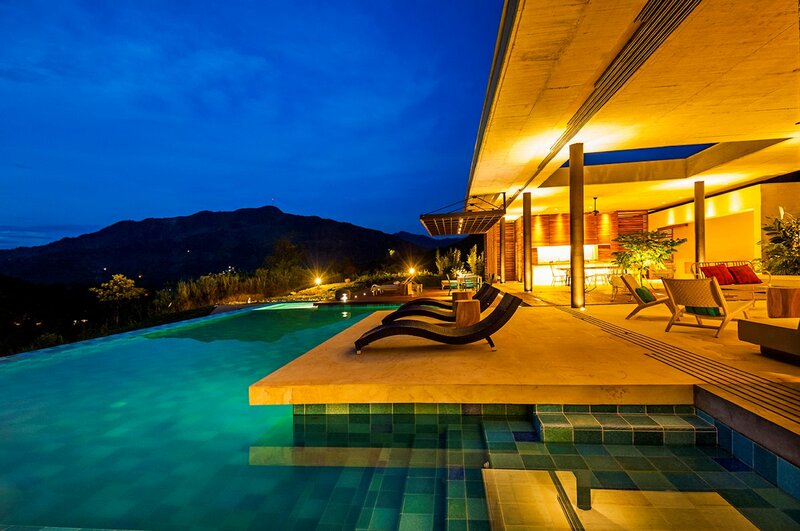 The house is oriented north-south, protecting the long/open facades from the sun while taking advantage of the beautiful views towards the mountains and the stream. 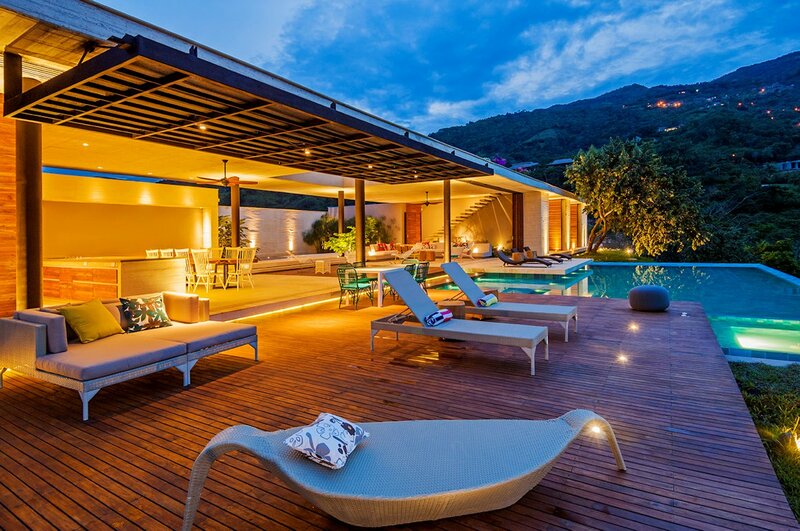 This also allows for the swimming pool and terrace areas to have permanent exposure to the sun, morning and afternoon, without being interrupted by the shadow of the house. 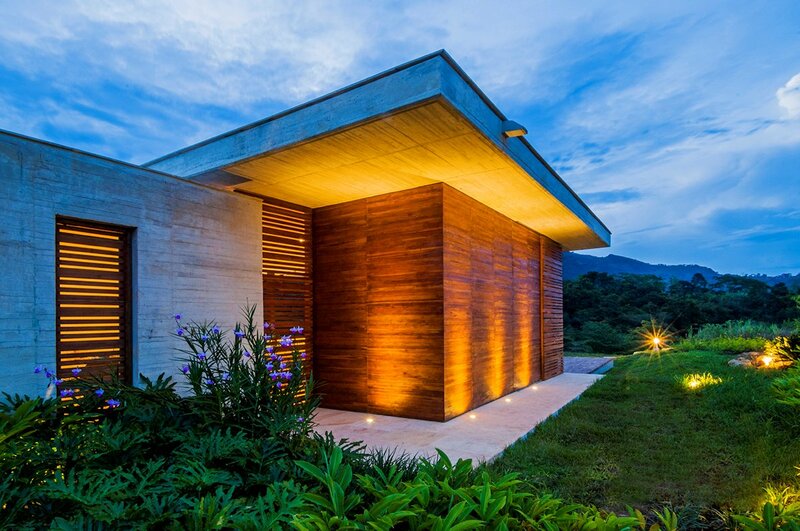 The project uses noble materials, expresses its materiality, construction process and natural composition. 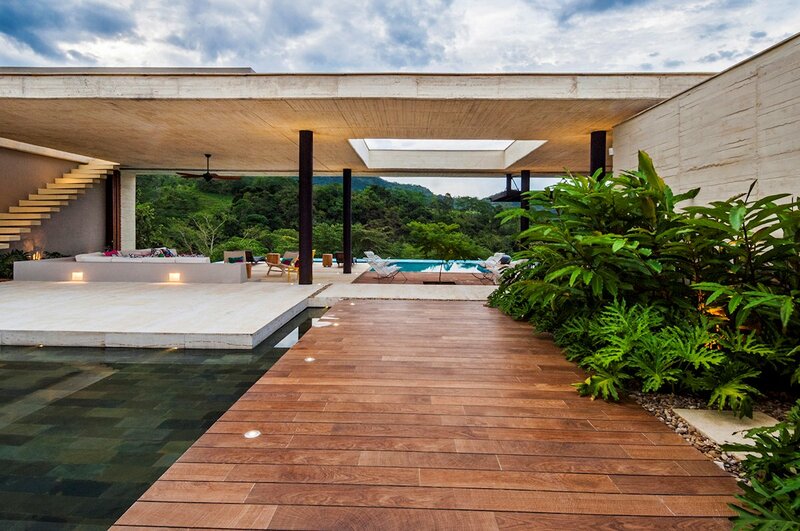 The predominant use of ocre tinted in situ concrete and teak generates an array of textures, colours and shadows that change with sunlight. 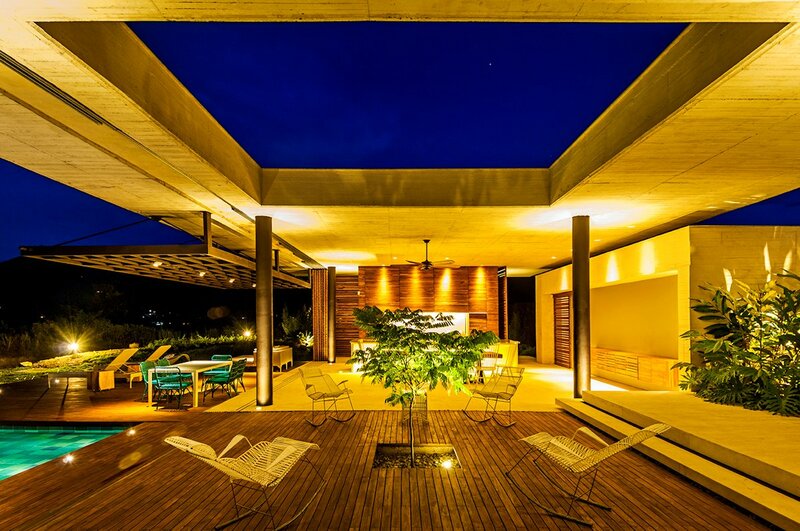 All the textures are defined by 2 modules, 5 and 10 cms, expressed in all the elements, from the timber formwork for the concrete to the teak elements in the wooden panels all the way through to the prefabricated elements that enclose the patio. 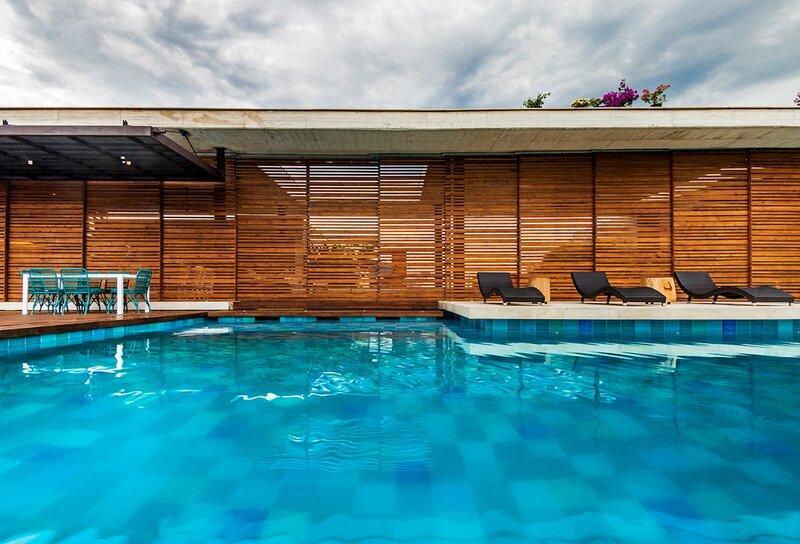 The walls and slabs are built by using in situ concrete, and the ocre tone achieved by using a mix of white cement and sand from Ambalema; the formwork was built with Tabebuia timber. 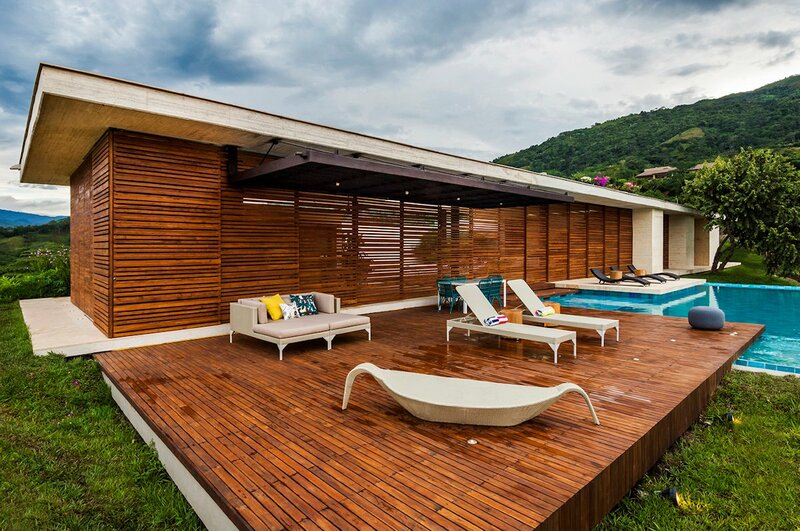 The other predominant material is teak (from sustainable forests), used indistictively as facade, furniture or floor finish. The floors, aiming to keep uniformity with the tone of the roof, are mostly built in sandstone. 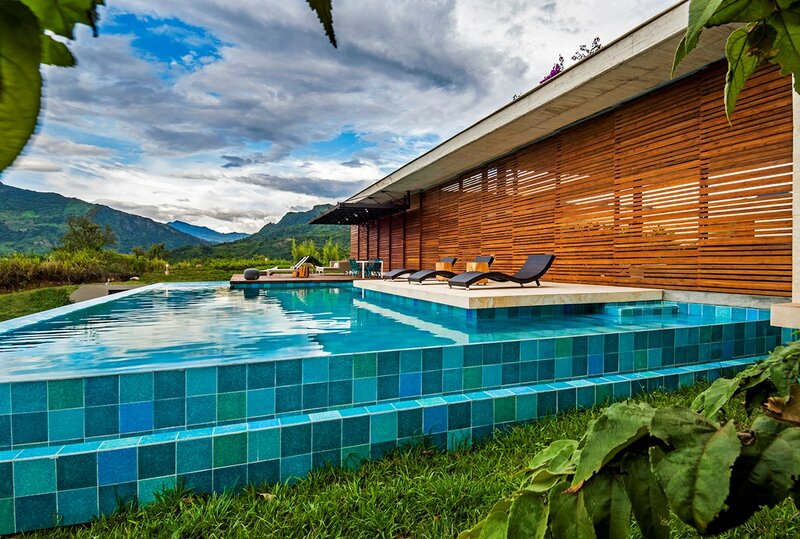 The finish for the swimming pool was achieved by generating a pattern inspired in the surrounding forest’s blue-green colours, using 20x20cm tiles, de-toned and hand painted.